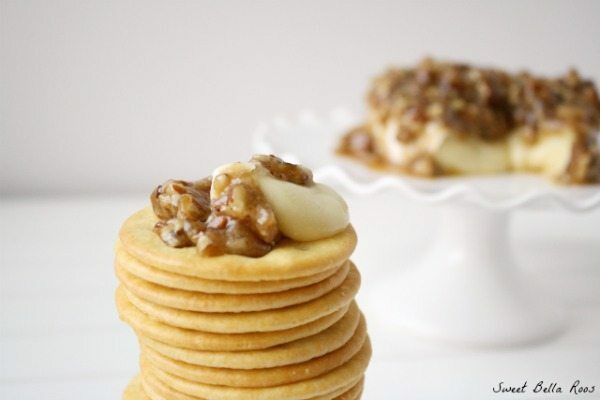 This Caramelized Pecan Brie is the perfect appetizer and sweet alternative to a traditional cheeseball. You won’t be able to stop at just one bite! I served this baby at a party I hosted last weekend, and I’ve already made it again just to snack on while cooking dinner. I wasn’t even sure I liked brie, but after seeing Ashton talk about it so much lately, I decided to give it a try. I had the same oh-my-gosh where has this been all my life reaction. Ashton mentioned her fav way to eat it is with brown sugar and pecans, and that is exactly what I did. Trust me, even if you’ve never tried brie, be brave and make this- you won’t regret it. I served this with plain, buttery crackers. I love wheat crackers for cheeseballs, but I prefer the lighter flavor of the buttery crackers for this. Seriously you could forget the crackers all together and just serve this Caramelized Pecan Brie with a spoon and I promise no one will care. Would also be great served with apple slices. Yum. This is my new go-to for serving at (and taking to) parties. Requires about 5 simple ingredients and 5 minutes to make and is a definite crowd pleaser. 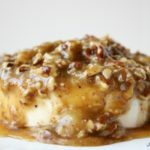 This Caramelized Pecan Brie is the perfect appetizer and sweet alternative to a traditional cheeseball. You won't be able to stop at just one bite! Combine the brown sugar, corn syrup, and butter in a small saucepan over medium high heat. Stir constantly until the butter is completely melted and mixture begins to soft boil. Allow to boil gently without stirring for one minute. Working quickly, remove from heat and immediately stir in salt and baking soda. Fold in the chopped pecans and mound the warm mixture on top of the brie. I like the pecans more finely chopped, but be careful not to make them "powdery". If the mixture is too hot and runs off the brie too quickly, just use a spoon to scoop it back on top until it sets. This recipe also doubles really well. I made this for Thanksgiving AND IT IS ABSOLUTELY DELISH!!!!! 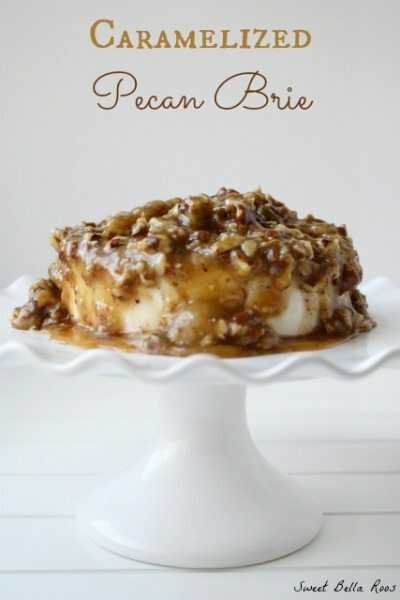 The caramel pecan topping did harden fairly quickly and it became difficult to eat. Any suggestions to help prevent this? 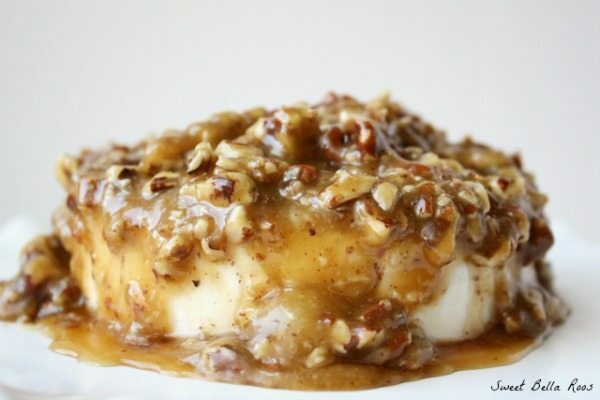 I have made this twice and have loved it both times, but my caramel gets hard very quickly. Any tricks or tips? Am I possibly cooking the sugar/syrup mixture too long? Should I add a dash of heavy cream or more butter to keep it from setting up? Any thoughts or recommendations? Thanks! OMGOSH! I am nuts for cheese – see what I did there?! – so this is making my mouth water. This looks delicious! My husband loves brie. His favorite is when it is wrapped in pastry with a raspberry jam kind of thing on top but I think he would love this even more. Thank you for sharing! I baked it for 12 minutes with rind first, before sauce and put it on a covered cheese dish to take to a party, it was still warm after arriving 15 minutes later. This was scrumptious. The recipe didn’t specify salted or unsalted, so I used salted organic butter. I think it might’ve been a tad sweet for me without the salt. Everyone loved it! Served with granny smith apples and bosc pears. YUMMY! I bet the extra sauce will be great warmed on ice cream. Do you prep the Brie like take off the rine. ALso, is the Brie warmed before or after the caramel topping? Hi Debe, I did not take the rind off beforehand (but I might in the future). I did not warm it before either, the caramel topping is hot and makes the brie just the right amount of gooey. Do u cut off the rind, since it’s not baked? Looks yummy! I did not, but I might next time! Thanks! Just wondering how you make ahead and bring it….or do you make it once you get there? Hi Kim- I usually make it ahead and just transport it in a small dish with a lid. Love this! Simple and sweet! I love brie and really need to serve it more often. Pinning!